Waldner invites you to visit our booth to see the most modern DOSOMAT Filling and Sealing Machines. The following machines will be showcased in Hall 7, Booth B-050. 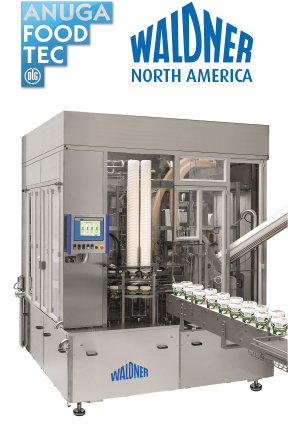 The most efficient yogurt filling for plastic cups with integrated packer, cup buffer system and integrated inkjet coding system. Features sealing from rollstock and H2O2 sterilization of cups with our UV-sterilization of sealing film.